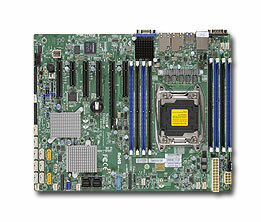 I still like this board: [WayBack] Supermicro | Products | Motherboards | Xeon® Boards | X10SRH-CF. It’s in my main virtualisation workhorse, uses little power, has loads of disk (SAS/SATA) ports, IPMI, two network connections and enough slots for memory and I/O to be extensible. I use it for most of my software development even when on the road: VPN home over one of the fiber connections and it screams.